So after our big day yesterday (which you can now get a sneak peek at on Projo.com), I was eager to tuck into one of my husband‘s homemade pizzas for dinner. After our meat-heavy weekend, we elected to go for a vegetarian pie topped with a few fresh, seasonal goodies. 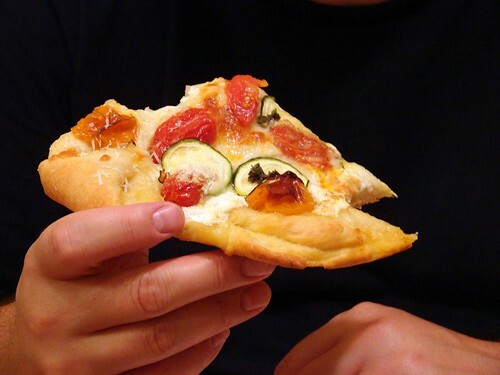 Mike dressed his standard crust with a layer of Amanda Hesser’s deliciously jammy roasted cherry tomatoes (from this food52 recipe), a blend of cheeses (including our favorite fresh mozz from Narragansett Creamery), and thin mandolined slices of zucchini. I gave the pizza a shower of freshly grated Pecorino Romano when it came out of the oven, along with a sprinkle of fresh marjoram leaves and a drizzle of Sicilian olive oil. The roasted tomatoes made for a delicious “sauce”, melting down even further into little orbs bursting with concentrated tomato flavor, and we loved how the paper-thin zucchini crisped and melded into the cheese. The marjoram, too, was a welcome change from basil, with a deeper, earthier flavor to complement the more concentrated flavor of the roasted tomato “sauce”, a gentle reminder a that cooler weather and heartier fare are not too far away. ps I just watched the video…you look beautiful and it’s so nice to hear your voice! Looks delicious! 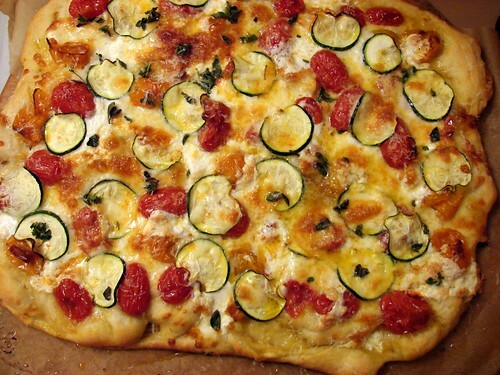 May try that for our weekly pizza this week– zucchini is one of our favorite toppings. Oh man, it must have been so weird to have someone film you eating. You want to look like you’re enjoying it, but you also don’t want to come off looking like a slob who inhales sandwiches. My hat is off to you. I don’t think I would let myself be filmed in that kind of situation. 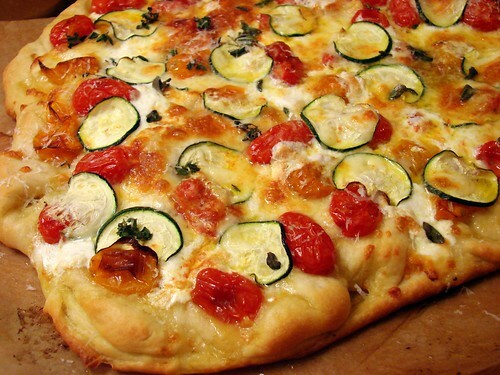 I love garden fresh zucchini on pizza! YUM! I feel like we have met now. It is so nice to see and hear you. Great job and you look great on camera too! I’m inspired to do a little more with my Friday night pizza. Thanks for the great posts and incredible photos. Wishing the clouds to lift for you quickly. I am so very sorry. I know it is a painful, huge hole. Jenn – so sorry for your loss. Our 12 year old cat (my first baby!) got killed by a Coyote on Labor Day weekend, we still haven’t stopped crying. Cats are the best. Maybe he will meet Kali up there somewhere, and they will both be laughing at our silly behavior down here. That is an impossibly perfect looking pie. Too good looking to eat actually!